A new series by award-winning author Tracey Corderoy hits the shelves today. 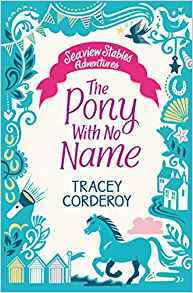 The first book in this middle grade series about 9 year-old Bryony is Seaview Stables Adventures: The Pony With No Name. Simon & Schuster will publish three Seaview Stables novels; books two and three will follow next year. Read the very interesting story of Tracey’s inspiration for the series on The Reading Zone here. Tracey is currently at The Edinburgh Festival talking about her books. Order a copy here, or ask for it at your local bookshop by clicking the link to the right.